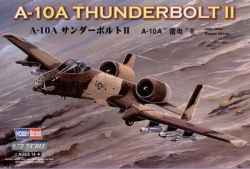 Highly detailed kit from Hobby Boss of the A-10A Thunderbolt, also known as the "Wart Hog". 917th TFW, Iraq, 1990. (As box art). 510th FS, 52nd FW, Germany, 1990.